Trisha lectures internationally and travels extensively. She has given trainings, workshops and keynote speeches in numerous countries including the Netherlands, Portugal, Germany, Turkey, Dubai, India, Japan, England, Australia, New Zealand and the United States. “I never planned any of this! 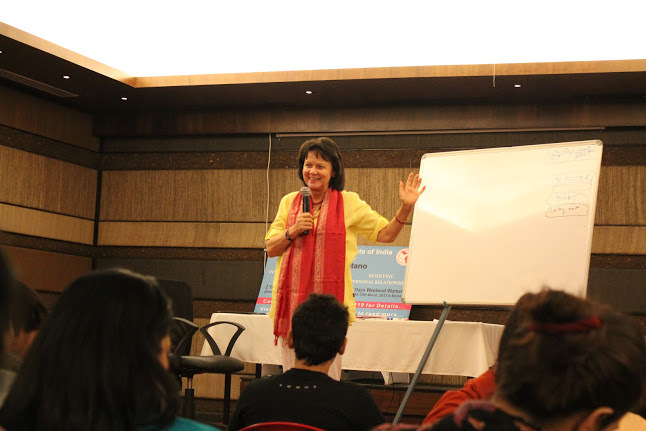 Institutes, schools and individuals simply heard about what I was doing and invited me to do trainings, seminars, lectures and workshops for their centers all over the United States. Individuals from other countries attending these presentations began to invite me to the institutes in their countries to do trainings, workshops, seminars and lectures for them. Since my one addiction is travel, it worked for me! More important, as I began to travel and experience other cultures, different ways of thinking, unfamiliar viewpoints and family systems, I was forced to stretch who I was to be able to encompass these different realities. Working in Europe in countries where they were invaded and taken over by another country created a generational impact with issues of shame, rage, sorrow, guilt and powerlessness to a degree that I did not find in the United States. Although I had worked with Viet Nam veterans and post-traumatic stress disorder, it is different when your homes are invaded and your women violated. Working with people who had been in prisoner of war camps in Indonesia or Germany made it necessary for me to understand and create new models of how to work with this kind of impacted trauma. In India I encountered ancient spiritual understanding, powerful Gods and Goddesses, deep and expanded awareness. I also found that the concepts of karma are completely different than mine, seemingly making justification for the appalling poverty. At the same time, people are so intelligent, so open-hearted and vibrant, tender and passionate, bursting into song or dance or games or spontaneous actions is an unending joy. The emphasis on family is a powerful force. This country stretched my therapeutic skills and enriched my life. The polar opposite culture is Japan. Zen Buddhism is the opposite of the wild colors, costumes, passionate Gods and intense feelings expressed in India. Strict cultural edicts based on honor, graciousness, composure and compassion touch me deeply. The awareness and appreciation of the most minute things enhanced my understanding. In Japan, so many subtle things are transformed into an art form; the effect of incense, the tea ceremony, the design in an obey, the shape and form of flower arrangements. In Japan, the things of true value are hidden including the deep spiritual ‘knowing’ that seems to flow through the energetic base of this country allowing for an intense, quiet celebration of life. Understanding and not judging people from countries with primarily arranged marriages or places where repression of woman was ‘normal’; this was a big step for me. Seeing how marriages functioned when they were based not on love but on other cultural priorities stretched my awareness.